When I was a curious preteen, I came across an intriguing idea in the spiritual literature of India: Ultimate knowledge has the answer to everything. How can that be? I thought. Suppose somebody discovers the nature of God, will that gain him the answer to a physics problem? I was stuck. It has been many years since then. Three decades ago, I did discover the nature of reality (and therefore God in some sense) while seeking the answer to what is called the quantum measurement problem. In quantum physics, objects are depicted as waves of possibility. How a possibility becomes an actual event of experience whenever an observer looks at it with a measuring instrument is the quantum measurement problem. If you think like most of the establishment scientists that consciousness is brain phenomenon, you get paradoxes. My discovery was, consciousness is the ground of all being, and objects are possibilities of consciousness itself to choose from. The paradoxes go away then. The discovery also integrates science and spirituality, which was my chief initial preoccupation. Eventually, I applied this new quantum philosophy of being to solving problems of biology and psychology: What is life? What is creativity? What happens when we die—do we reincarnate? That these sorts of questions met with a lot of success were encouraging. When the Dalai Lama challenged a group of scientists, that included me, to apply our new paradigm to solving the world’s current problems of health, education, economics, and politics, I began to pay attention to contemporary social issues. And there too, like magic, the quantum way of looking at these problems, you can call it a worldview if you like, led to real pragmatic solutions. I was pleased. I was surprised, and I remembered. Is the quantum worldview the ultimate knowledge in which we can solve every problem, ancient or modern, traditional or contemporary? It sure seems that way. There were of course more mundane things that helped too. An organization in Tokyo noted that I have no publication in the Japanese language; and so they invited me to give a workshop on my work and also to have a dialog with businessman/philosopher Massao Hori, which then would be published as a book. And it has been so published in Japan. My publisher in America, however, wanted the book not as a dialog but as a regular trade book. So I rewrote the original dialogs and included a lot more. And wonder of wonders, when my publishing staff saw the result, they chose the name The Everything Answer Book. Somehow they knew what my heart knew. So the quintessential question: Does the quantum worldview have all the answers. I really believe so having applied it to many problems during the course of many years. I will give a short review and let you be the judge. There Are Two Domains of Reality: Consciousness is the ground of all being and experiences. Besides space and time of the manifest world, there is an unmanifest domain of potentiality where all objects of experience are possibilities for Consciousness to choose from. We are all instantly interconnected through the “nonlocality,” of this impersonal, infinite domain that transcends space and time. In psychological terms, the unmanifest is your unconscious, but don’t be confused. The quantum unconscious is much broader in scope that what Freud or even Jung envisioned.Do you see the power this knowledge gives you? You, we all, are instantly interconnected through our unconscious; however it is a potentiality. To actualize our connectedness, we can meditate together with intention to be connected, we can make a relationship that is not hierarchical but circular, or we can collaborate on a creative venture. Holistic Irreducibility: The living cell and the brain that make manifest representations of consciousness in space and time contain irreducible wholes called “tangled (or circular) hierarchy.” Consciousness identifies with these systems while changing their possibility into actuality. As a result these systems have the self-experience of “life” separate from environment and “subject” separate from objects respectively. In this way, this aspect of the quantum worldview gives a basis for understanding biology—the science of life, and psychology—the science of the our self and its experiences. The Primacy of Subjectivity: Balancing and harmonizing both subjectivity and objectivity are essential to being human; however, objectivity is rooted in subjectivity—subjectivity in consensus. Nothing exists independent of consciousness. Meditate on this and you will feel the power of your subjectivity. Your free will is not the ornamental epiphenomenon of the brain that materialists claim; it has freedom to say “no” to your conditioning that makes you mechanical and determined. This is how you can open up to the real freedom of choice that lies in your unconscious ground of being. Multiplicity of Human Experiences: From item 1, when you grasp that the quantum worldview opens the door to a science of all our experiences, you begin to see that our education must emphasize all five kinds of human experiences each with the idea of exploring the huge potentialities of transformation, intelligence, and fulfillment: (1) Sensing (physical objects); (2) Feeling (vitality); (3) Thinking (meaning); (4) Intuiting (purposive archetypal or spiritual values such as truth, love, abundance, etc. ); and (5) Wholeness (bliss). Right now, education is way unbalanced toward the material. This has led to a neglect of the artistic and humane dimensions of the human being. In this way, the quantum worldview will revive the arts and humanities in our educational systems. Creativity and Spirituality: The vehicles of representation making—the cell and the brain—make memory as experiences happen. This has the effect called conditioning—a tendency to respond to a stimulus as in previous encounters. The conditioned self is our ego. Quantum creativity consists of a “discontinuous” leap from the known arena of the ego to the unknown arena of new quantum possibilities of the unconscious that then manifests in the primary unconditioned “quantum self.” The creative exploration of new mental meaning, archetypal purpose, and spiritual wholeness is fundamental to being human. It elevates human free will to say “no” to conditioning and enables real freedom of choice from new quantum potentiality. The quantum worldview gives us a creative process that agrees with empirical data and provides a viable universally usable technique for both outer novel accomplishments and inner psychological and spiritual transformation. In this way, when you see that your intuitions and following them up with quantum creativity is the real secret of manifestation, you will be empowered. Hierarchy of Needs: Human enterprises must involve satisfying the needs of all human experiences, from the most basic survival needs to the pinnacle of self-realization. This includes but transcends material sensing and artificial computer thinking. 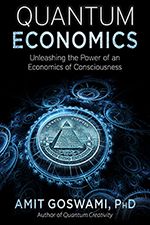 This gives us the key to a new paradigm of economics: The extension of Adam Smith’s capitalism from the material domain to all other domains of human needs—the vital, the mental, the archetypal, and even wholeness itself. Reincarnation: Human life has many incarnations, albeit the spirit per se is neither born nor dies; through various human incarnations our capacity to creatively explore meaning and purpose increases. When we realize and fully grasp this aspect of the quantum worldview, we recognize death for what it is: a way station for the purpose of renewal. Besides nature and nurture, there are propensities from past lives that we can manifest in this one. Through memory retrieval and past life regression techniques, we can get a sense of the purpose of our lives and live our lives with the bliss of purposeful exploration. Evolution of Consciousness: Evolution is purposive consisting of both homeostasis and quantum leaps. In the past, evolution has given us the instinctual brain circuits of pleasure and pain and the collective unconscious (of Jungian vintage) that we all share. Its objective right now is to transform our rational mind to produce greater and greater embodiment of archetypal (spiritual) values, an embodiment that traditionalists call the soul. Some of us have been doing this soul making for many incarnations already. For us, it is our special responsibility to align ourselves to the evolutionary movement of consciousness and contribute to more soul making on the planet. Social Relationships: The “We” of relationships, the “We” of quantum nonlocality and “tangled hierarchy” must supplement our simple hierarchical individuality. In economics, politics and other social systems, this translates as the integration of homo economicus (the selfish human of Newtonian vintage) and homo communus (the nonlocal human of quantum vintage). The Importance of Multiple Forms of Intelligence: Currently we are stuck with the materialist concept of intelligence as measured by our IQ. The idea of transformation from the stage of the rational mind to the soul being introduces us to the additional concepts of emotional and supra-mental intelligence. In essence, this leads to the spiritual concept of integrating the brain—the seat of the rational mind—with the heart—the seat of love, except that the quantum worldview gives us practical ways of achieving this integration. Arriving at supra-mental intelligence brings us the highest satisfaction and sustenance. The quantum worldview recognizes only one other state of more wholeness than this, but that state of mystical enlightenment is not an achievement, it is liberation from all achievements. All this is the subject of my latest book, The Everything Answer Book. I hope you can see that the quantum worldview does give answers to perennial questions of meaning and purpose, of life, love, satisfaction, intelligence, and even of enlightenment. It gives us the tool—creativity—for achievement of all human potentiality. It revives the arts and the humanities and gives us new approaches to social sciences like economics. Read the book; you will be inspired to find, as I am inspired, that solving our contemporary problems of climate change, terrorism, economic meltdowns, political polarization, cost-contained health care and more is only a matter of perseverant and creative use of the quantum worldview. 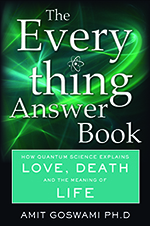 Look for Dr. Amit Goswami’s latest book, The Everything Answer Book: How Quantum Science Explains Love, Death and The Meaning of Life (ISBN 978-1571747624, Hampton Roads Publishing, distributed by Red Wheel/ Weiser) at your favorite bookstores.